Last year, I decided to learn to sail. I’d sailed a bit as a kid, but it’d been a long time (and I never really knew what I was doing then, anyway), so I figured it’d be good to learn for real, in order to start exploring the amazing waterways we have up here in the Puget Sound area. So I signed up for the ASA 101 course at Puget Sound Sailing Institute, took it over a weekend (after studying for a good two weeks), passed (with a perfect score, woo!) and then joined the Open Boating program at Sail Sand Point here on Lake Washington, where I spent the remainder of the summer and early fall practicing on Lasers, FJs and Hobie Waves, the latter of which has become a favorite for Sunday afternoons with the wife and kiddos. 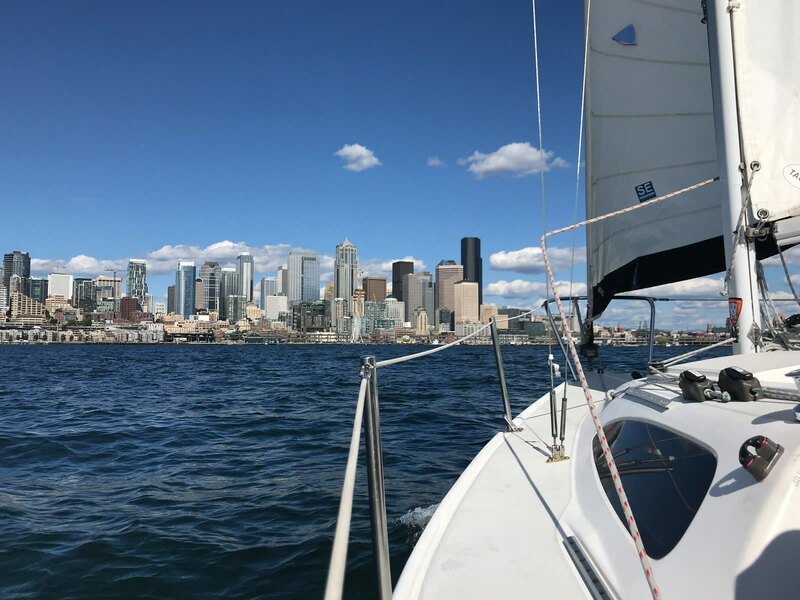 This year, it’s more about getting out on the bigger keelboats for me; it’s one thing to zip around on the lake in a dinghy, where the only real risk is the occasional capsize, but it’s another thing entirely to navigate safely under sail around all the ferries and container ships moving about on Elliott Bay. So every couple of weeks or so, I’ve been getting out on a great little Catalina 22 with a few of my fellow Chefs — making mistakes, learning a ton, and gaining the confidence I’ll need to get around here on my own someday, hopefully soon. Here’s a shot from a recent outing.